Not to be confused with scareware. 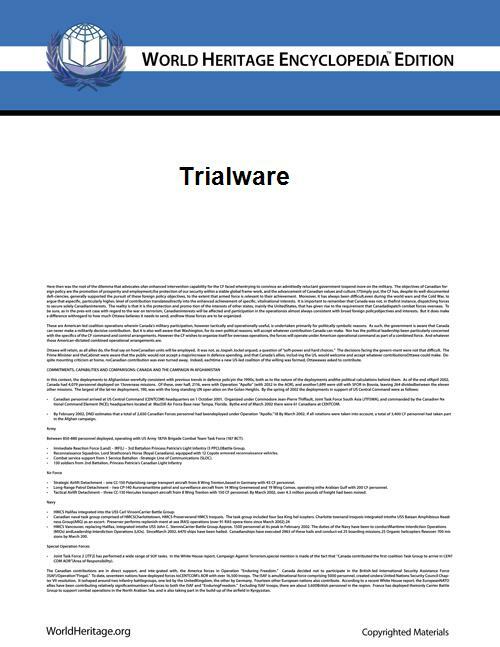 Shareware (also termed trialware or demoware) is proprietary software that is provided to users on a limited basis and only for a certain limited trial basis and pursuant to a license which restricts any commercial benefit, use or exploitation of the software. While there may not be an initial up front payment, the license pursuant to which the software is provided limits and restricts usage and typically restricts any distribution for commercial purposes and is often limited by any combination of functionality, availability (it may be functional for a limited time period only), or convenience (the software may present a dialog at startup or during usage, reminding the user to purchase it; "nagging dialogs"). Shareware is often offered as a download from an Internet website or as a compact disc included with a periodical such as a newspaper or magazine. Shareware is a portmanteau word combining share and software. The rationale behind shareware is to give potential users the opportunity to try out the program on a limited basis for a limited time and judge its usefulness before purchasing a license for the full version of the software. Firms with superior software thus have an incentive to offer samples, except if their product is already well known, or if they do not want to be listed in direct competition with other products on shareware repositories. Shareware is usually offered either with certain features only available after the license is purchased, or as a full version but for a limited trial period of time. In this context, there is no difference between 'shareware' and a 'Free Trial' version of normal commercial software. Once the trial period has passed, the program may stop running until a license is purchased, or run with limitations such as quitting after a short elapsed time or the inability to save work. Shareware is often offered without supports or updates which only become available with the purchase of a license. The words "free trial" or "trial version" are indicative of shareware. Shareware is often packaged with adware. During the install of the intended software, the user is presented with a requirement to agree to the terms of click thorough licensing or similar licensing which governs the installation of the software. The term shareware is used in contrast to open-source software, in which the source code may be available for anyone to inspect and alter, and freeware, which is software distributed at no cost to the user but without source code being made available. In 1982, Andrew Fluegelman created a program for the IBM PC called PC-Talk, a telecommunications program, and used the term freeware; he described it "as an experiment in economics more than altruism". About the same time, Jim "Button" Knopf released PC-File, a database program, calling it user-supported software. Not much later, Bob Wallace produced PC-Write, a word processor, and called it shareware. Appearing in an episode of Horizon titled Psychedelic Science originally broadcast 5 April 1998, Bob Wallace said the idea for shareware came to him "to some extent as a result of my psychedelic experience". In 1984, Softalk-PC magazine had a column, The Public Library, about such software. Public domain is a misnomer for shareware, and Freeware was trademarked by Fluegelman and could not be used legally by others, and User-Supported Software was too cumbersome. So columnist Nelson Ford had a contest to come up with a better name. The most popular name submitted was Shareware, which was being used by Wallace. However, Wallace acknowledged that he got the term from an InfoWorld magazine column by that name in the 1970s, and that he considered the name to be generic, so its use became established over freeware and user-supported software. Fluegelman, Knopf, and Wallace clearly established shareware as a viable software marketing method. Via the shareware model, Button, Fluegelman and Wallace became millionaires. Prior to the popularity of the World Wide Web and widespread Internet access, Shareware was often the only economical way for independent software authors to get their products onto users' desktops. Those with Internet or BBS access could download software and distribute it amongst their friends or user groups, who would then be encouraged to send the registration fee to the author, usually via postal mail. During the late 1980s and early 1990s, shareware software was widely distributed over bulletin board systems globally and on diskettes. Contrary to commercial developers who spent millions of dollars urging users to Don't Copy that Floppy, shareware developers encouraged users to upload the software and share it on disks. Commercial shareware distributors such as Educorp and Public Domain Inc produced catalogs describing thousands of public domain and shareware programs that were available for a small charge on floppy disk and later CD-ROM. One such distributor, Public Software Library (PSL), began an order-taking service for programmers who otherwise had no means of accepting credit card orders. Later, services like Kagi started offering applications that authors could distribute along with their products that would present the user with a form to fill out, print, and mail along with their payment. Once telecommunications became more widespread, this service also expanded online. As Internet use grew, users turned to downloading shareware programs from FTP or web sites without paying long-distance charges or disk fees. This spelled the end of bulletin board systems and shareware disk distributors. At first, disk space on a server was hard to come by, so networks of non-profit mirror sites like Info-Mac, containing large shareware libraries were developed, accessible via the web or ftp. With the advent of the commercial web hosting industry, the authors of programs developed their own sites where the public could learn about their programs and download the latest versions, and even pay for the software online. This erased one of the chief distinctions of shareware, as it was now most often downloaded from a central "official" location instead of being shared samizdat-style by its users. To ensure users would get the latest bug-fixes as well as an install untainted by viruses or other malware, some authors discouraged users from giving the software to their friends, encouraging them to send a link instead. The Internet made it easier to locate niche software, as well as the best and most popular general software. During the early 2000s, and with the increasing popularity of Web 2.0, new ways to filter the software became available. Major download sites began to rank titles based on quality, feedback, and downloads. Popular software was sorted to the top of the list, along with products whose authors paid for preferred placement. Blogs and online forums further enabled individuals to spread news about titles they like. With this pruning in place, consumers can more easily find quality shareware products while still preserving the ability to find obscure and niche software. Some titles display a dialog box with payment information and a message that paying will remove the notice, which is usually designed to annoy the user into paying; this is termed nagware. Paying will provide the user with a licence key or pass code they can enter into the software to enable full functionality. Some shareware requires no password, simply checking an "I have paid" checkbox in the application is all that is required to disable the registration notices. Sometimes a more elaborate action is required, such as clicking an obscure area of a window while holding down a modifier key. These tricks were more easily kept secret before the popularity of the Internet. Some shareware items require no payment; just an email address, so that the supplier can use this address for their own purposes. Shareware is available on all major computer platforms, including Microsoft Windows, Macintosh, Linux, and Unix. Titles cover a very wide range of categories including: business, software development, education, home, multimedia, design, drivers, games, and utilities. Because of its minimal overhead and low cost, the shareware model is often the only one practical for distributing non-free software for abandoned or orphaned platforms such as the Atari ST and Amiga. With shareware, a developer bypasses the retail distribution channel eliminating middleman markups and directly markets to the end user. The result is a reduced end-user price and direct contact with the author of the software. The hope is that users will find the program useful or entertaining. In the early to mid-1990s, large online distribution channels such as Download.com, Tucows, Yahoo! Games and RealArcade emerged. These portals acted as media of distribution for the shareware developers, providing a much larger audience than before. Many shareware developers are individual computer programmers who develop their own product. Online shareware author communities, like the newsgroup alt.comp.shareware.authors, are often used by software seekers to post their novel software ideas for potential implementation. In the early 1990s, shareware distribution was a popular method of publishing games for smaller developers, including then-fledgling companies such as Apogee Software (also known as 3D Realms), Epic Megagames (now Epic Games), Ambrosia Software and id Software. It gave consumers the chance to play the game before investing money in it, and gave them exposure that some products would be unable to get in the retail space. With the Kroz series, Apogee introduced the "episodic" shareware model that became the most popular incentive for "registering" (or buying) the game. While the shareware game would be a truly complete game, there would be additional "episodes" of the game that were not shareware, and could only be legally obtained by paying for the shareware episode. In some cases these episodes were neatly integrated and would feel like a longer version of the game, and in other cases the later episode(s) would be stand-alone games. Sometimes the additional content was completely integrated with the unregistered game, such as in Ambrosia's Escape Velocity series, in which a character representing the developer's pet parrot, equipped with an undefeatable ship, would periodically harass and destroy the player after they reached a certain level representing the end of the trial period. Racks of games on single 5 1/4 inch and later 3.5 inch floppy disks were common in retail stores. However, bulletin board systems (BBS) and computer expositions such as Software Creations BBS were the primary distributors of all early low-cost software. Free software from a BBS was the motive force for consumers to purchase a computer equipped with a modem, so as to acquire software at no cost. At PC expositions, extant today, shareware was essentially free; the cost only covered the disk and minimal packaging. The important distinguishing feature between a shareware game and a game demo is that the shareware game is, at least in theory, a complete game. Where modern demos are often a single level or less, shareware games usually had many hours of play with a beginning, middle, and end. Shareware episodes most commonly offered 1/3 or 1/2 of the entire registered version, and many even offered the entire product as shareware with no additional content for registered users. In the 1980s and early-to-mid 1990s, shareware was considered to be a concept for independent software writers to receive a degree of remuneration for their labor. However, after that the shareware model began to degrade as the term was used by commercial startups offering (sometimes substandard) commercial software and labeling non-functional or limited demo versions (termed crippleware) as shareware. As a result, in the early 21st century, the term shareware was being used less, replaced by either demo for trial software or freeware for full editions. Some shareware groups have liberal standards, allowing 'nag screens' that remind the user to buy the software, demonstration or "demo" versions and trialware. Some have refused to accept any software with limited functionality, including demos, trial use, or crippled software. Most groups, such as the Association of Software Professionals, the Software Industry Professionals group and PC Shareware clearly state their position that any software marketed as 'try before you buy' is shareware. Another type of shareware software distribution very popular in the mobile domain are app store markets (e.g., see List of mobile software distribution platforms). There, users can often obtain applications that are free and advert banner supported, and often a paid version with no ads and maybe more features. FILE ID.DIZ is a descriptive text file often included in downloadable shareware distribution packages. Portable Application Description (PAD) is used to standardize shareware application descriptions. PAD file is an XML document that describes a shareware or freeware product according to the PAD specification. Code signing is a technology that is used by Shareware developers to digitally sign their products. Versions of Microsoft Operating Systems, since Windows XP Service Pack 2 show a warning when the user installs unsigned software. Look up shareware in , the free dictionary.